While still a student engineer Dr. Kerr participated in the design and testing of an automatic surveying instrument. This instrument aligns the N. A. S. A. space vehicle guidance system seventeen seconds before launch. The lives of Moon visitors depend on this. If they are only slightly off course after blasting off they may miss the Moon and never return to the Earth. His first professional work in 1964 showed N. A. S. A. how a laser can communicate between the earth and a space probe near Mars, at a distance of 100 million miles. Dr. Kerr designed a laser instrument for measuring the height of volcanoes and the depth of valleys and rifts on Mars. The finished instrument, the Mars Global Surveyor, is still orbiting Mars. It was the first successful use of a laser beyond the orbit of the Moon. Thanks to the instrument our contour maps of Mars are better than the ones we have of the Earth. Another instrument like the first mapped the Asteroid Eros and reposes on it. A third instrument is aboard the MESSENGER mission to Mercury. The Japan Aerospace Exploration Agency put a similar instrument on the Hayabusa space probe, which recently returned rock samples from the Asteroid Itokawa. N. A. S. A. awarded Dr. Kerr a prize for his design of a telescope (shown at right) adapted to receive laser communications from space probes going to Jupiter, Uranus, and Neptune, into the Kuiper Belt as far as 35 times the distance to Pluto, or beyond. The telescope will be one of the largest in the world. Universidad de Sevilla, Facultad de Física, Departamento de Electrónica y Electromagnetismo, Grupo de Microondas, invited professor, from November 1990 through October 1991. Member of the Technical Staff, N. A. S. A., Jet Pro­pulsion Laboratory, California Institute of Technology, 1986 to 1989. Associate Professor of Physics, Azusa Pacific University, 1985 to 1987. Profesor Asociado de Física, Universidad de Costa Rica, 1975 to 1982. Artificial languages: FORTRAN, Basic, a smattering of assembly languages, DOS, Windows, Internet. Natural languages: First language: English. Have full fluency in Spanish for conversation, teaching, reading, and writing. Can read articles in my specialty and speak as a tourist in French and German. Can read Biblical Greek and decipher Hebrew with a lexicon. Have some knowledge of Russian. 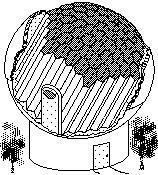 “A Near-Earth Optical Communications Terminal With a Corevolving Planetary Sunshield,” Telecommunications and Data Acquisition Progress Report 42-91, 133-140 (15 Nov 1987), also published in Journal of The British Interplanetary Society 42, 497‑500, (1989). “La propagación del haz gausiano en un medio dieléctrico con inhomogeneidad radial parabólica y cuártica,” (“Propagation of a Gaussian Beam in a dielectric medium with parabolic and quartic radial inhomogeneity”), Ciencia y Tecnología 3, 27-34, (1979). “Surface and Coating Absorption Measurement with an Alphaphone,” Laser-Induced Damage in Optical Materials: 1973, A. J. Glass and A. H. Guenther, editors (National Bureau of Standards, Boulder, Colorado, 1973) 189-193. “Filamentary Tracks Formed in Transparent Optical Glass by Laser-Beam Self-Focusing. III. Filament Formation,” Physical Review A 6, 1162-1171, (1972). “Filamentary Tracks Formed in Transparent Optical Glass by Laser-Beam Self-Focusing. II. Theoretical Analysis,” Physical Review A 4, 1195-1218, (1971). “Electrostrictive Laser Beam Focusing in Glass and Small-Scale Track Formation,” Damage in Laser Materials: 1971, A. J. Glass and A. H. Guenther, editors, (National Bureau of Standards, Boulder, Colorado, 1971), 61-75. “The Laser Illuminated Absorptivity Spectrophone: A Method for Measurement of Weak Absorptivity in Gases at Laser Wavelengths,” Applied Optics 7, 915-921 (1968), with J. G. Atwood. “Laser Altimeter for Mars Sample Return Mission,” Jet Propulsion Laboratory Interoffice Memorandum 331-86.6-270, 18 November 1986, and “Laser Pushbroom Altimeter for Mars Sample Return,” Jet Propulsion Laboratory Interoffice Memorandum 331-86.6-279, 5 January 1987. These two memos were preliminary designs for the Mars Orbiter Laser Altimeter, part of the Mars Global Surveyor, in Mars orbit since 15 September 1997. Another version reposes on the Asteroid Eros, and a third is measuring Mercury.